True Blue: An authentic cultural adventure unfolds along Papua New Guinea’s seldom-sailed Sepik River. All eyes are on the eight young men seated around the fire. The skin on their backs and shoulders is deeply scarred, having been stippled with razor blades in a pattern modeled after the scaly hide of a crocodile. The wounds have been pasted with ash and river mud and pummeled with bamboo bats, and are now drying in the heat of the blaze. Reserved for men over the age of 20, this ceremonial ritual is conducted generation after generation in Papua New Guinea’s Iatmul culture, which holds that its people evolved from crocodiles. Witnessing this rite of passage is a rare privilege for outsiders—and one of several insider cultural experiences on a True North adventure through Papua New Guinea. 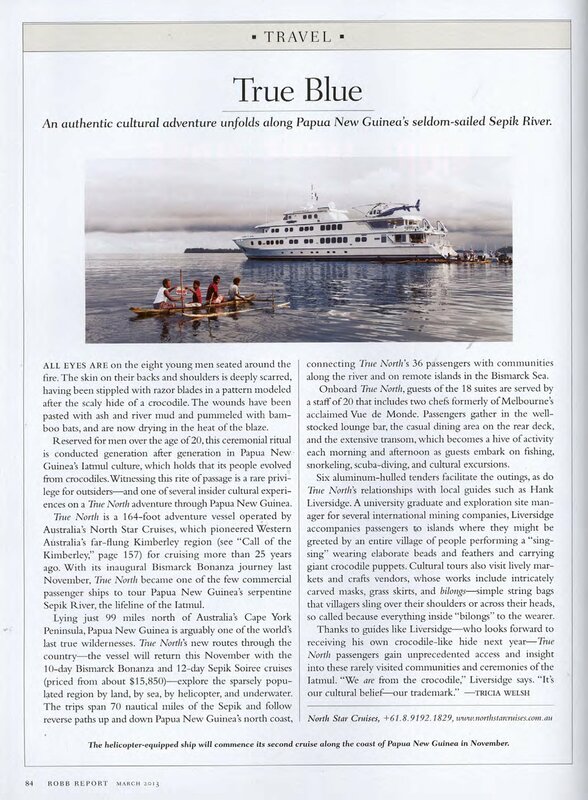 True North is a 164-foot adventure vessel operated by Australia’s North Star Cruises, which pioneered Western Australia’s far-flung Kimberley region (see “Call of the Kimberley,” page 157) for cruising more than 25 years ago. With its inaugural Bismarck Bonanza journey last November, True North became one of the few commercial passenger ships to tour Papua New Guinea’s serpentine Sepik River, the lifeline of the Iatmul.